The drama is set in a realistic yet fictional world in an 18th century England at war with France, with a feeble Queen Anne (Olivia Colman) as head of the state. While Queen Anne is busy worrying about her pains and 17 rabbits, her crossdressing confidante Lady Sarah (Rachel Weisz) is dealing with political affairs — her husband is the head of the Whig Party and deeply influential. Abigail (Emma Stone), a new servant and fallen aristocrat, tends to the queen, while Lady Sarah is out governing the country and soon Abigail replaces Lady Sarah to become the favourite. The journey is unpredictable in the way you interpret the characters from the beginning to the end, as your understanding of them transforms. There is a mix of love and politics with toxic relationships that festers into the suffering of all the characters in some way or form. The audience realizes the difference between true love and being used for power. The film has a powerful female presence with strong performances from Colman, Weisz and Stone that have earned them each Academy Award nominations. Colman was nominated for best actress and in a rare move in Hollywood, both Weisz and Stone were nominated for best supporting actress. Arguably, the way the film is structured, it is as though there are three protagonists and three leading ladies. It would have been interesting to see three women competing for the same category, and in the future maybe the Oscars will consider it. There really haven’t been many Academy Award-nominated films with three leading female performances that are equally important and well done. The script for the film was initially written in 1998 but because of its LGBT content it wasn’t made. It was recently nominated for a GLAAD award, which is a media award that honors inclusive and fair representations of the LGBT community and issues they face. 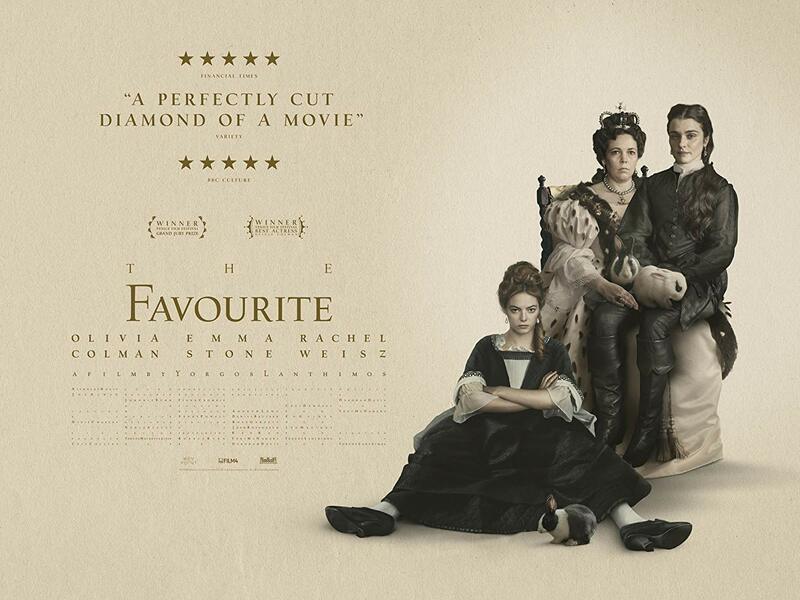 “The Favourite” made an estimated total of $52 million dollars worldwide and was well received by critics, with a 93 percent Rotten Tomatoes rating and a 90 percent Metacritic rating. Costume designer Sandy Powell, whose costume design for the film was nominated for an Academy Award as well, created beautiful costumes with silhouettes that were accurate to the Baroque period, but modernized the look through experimenting with textures and fabrics unavailable during the time period. Powell described this choice as a way to invent a whole different world, which was Lanthimos’ goal: a depiction of history that is certainly inaccurate, but to the common person without the appropriate historical knowledge, it is a tale that holds up all on its own. Lanthimos and Powell agreed to limit the color palette of the costumes for the royal court to neutral colors such as black and white. Weisz described it as if the royal court looked like a chess board, which is a vital part of the world of “The Favourite” and its power moves. The music choice also played a substantial part in the transitions of the film, featuring songs from composers like Antonio Vivaldi, Wilhelm Bach, George Handel and other artists with Baroque-sounding music. The music invokes a dark and volatile atmosphere with a focus on the harpsichord that gives a dreary aura playing off of the characters’ moods and a strong string section that emphasizes the struggles between them. As for the cinematography, the movie uses a range of high and low shots, fisheye lenses that give wide shots, steady fluid shots, natural lighting, nighttime candle work and a whip pan, which is used to make sure that the scene doesn’t have to be cut. The camera action made for an observational-like appearance for the audience. It is a way for us to follow the story the way Lanthimos wants to tell us. The audience can see the whole room and multiple characters interacting, with us knowing information that maybe another character doesn’t.